Note that the correction doubles down on the misleading story. 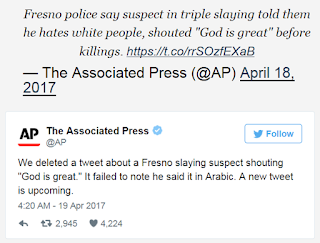 The man shouted, “Allahu Akbar,” and even after being caught out in a deliberate misrepresentation, the AP apologized and promised to correct the half-truth with a different half-truth. 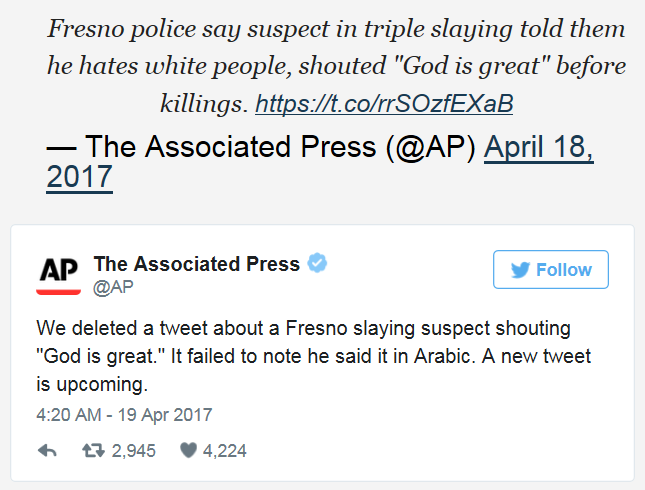 This sort of deception is so commonplace that viewers now assume any reports on terrorist acts will be white-washed by the media. My own introduction to this story came by way of the always reliable Twitter, and featured a thread in which an argument had broken out regarding whether or not the Facebook Killer was a terrorist. It seems in the aftermath that he was not. Maybe he was, and maybe he wasn’t. Either way, notice that part of the cost of the mainstream press’s utter abdication of reporting in favor of proselytizing is the immediate suspicion that any random act of insanity must be motivated by the current bête noir that the media so diligently sweeps under the rug. Their lack of integrity and foolish pride have actually resulted in a world where the ideology they want to protect is now far more likely to be falsely accused of motivating crime than it would be if they simply honored their word and stuck to reporting the facts. Nice bed you made there, media. Hope you enjoy lying in it – you’re going to be there for a long time.